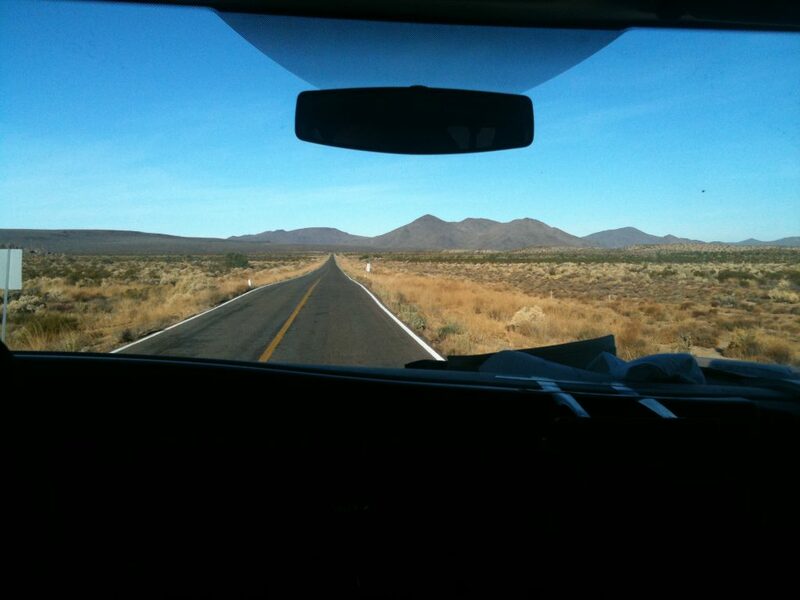 When we crossed the Mexican border, I had slept less than 15 hours in the past 5 days. 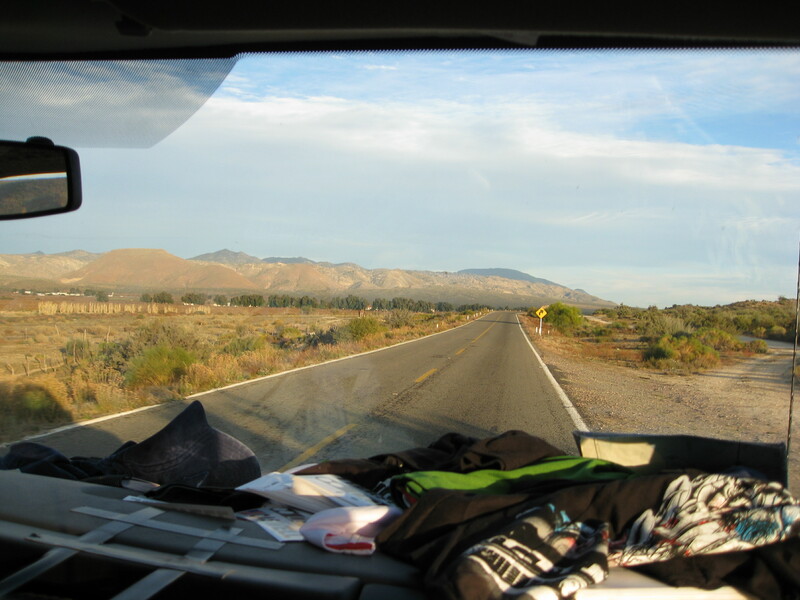 Sitting in the back of a newly rented 15-passenger van I had little clue what was ahead of us. And, as any Bill Caswell-related adventure goes, it would entail a lot. I tried to sleep. I really did. 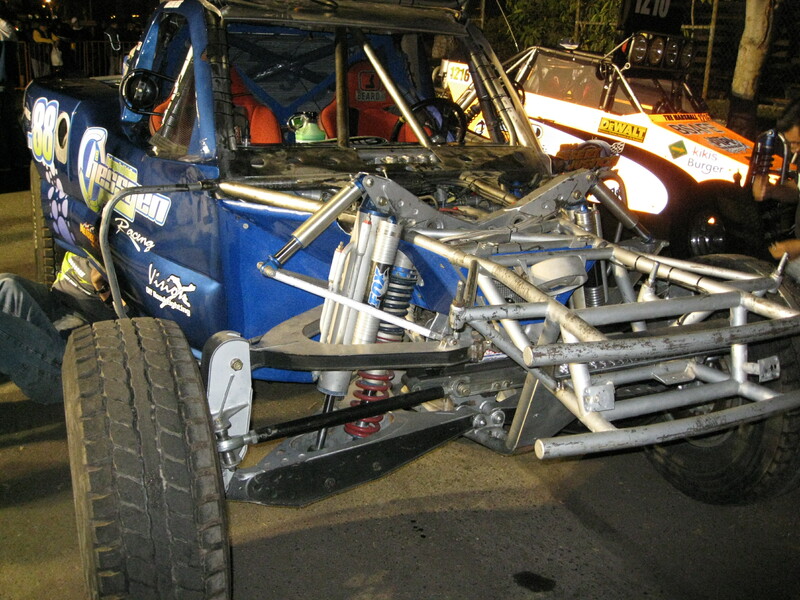 But, a week of building a race car while consuming insane quantities of coffee, NOS Energy Drink and alcohol made it hard. (Caswell edit: there were a lot of burritos and In-n-out Burger too). 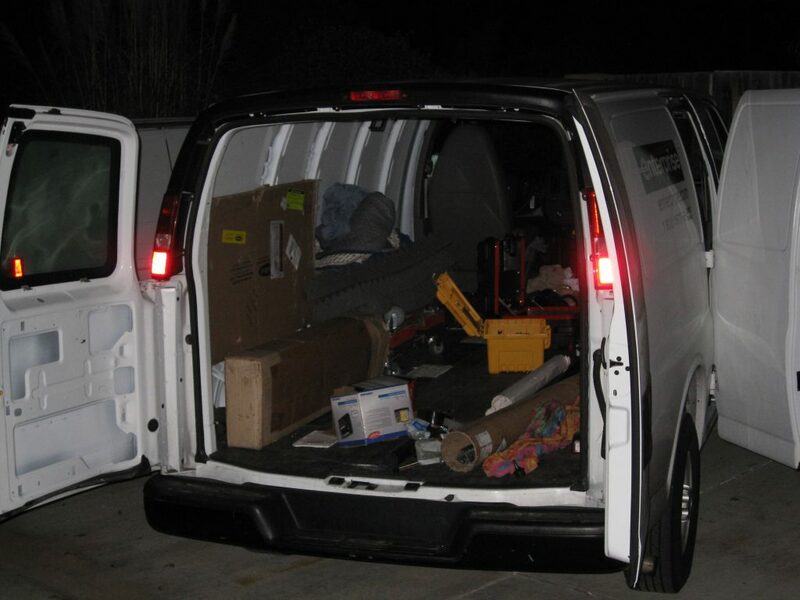 The adventure started when Caswell picked me at up from the airport in his rented cargo van. On our way to his apartment we had the idea to stop and have a few margaritas. This was the first time I saw a badge on the trip. We were pulled over for crossing a “double double yellow line,” which neither one of us Midwesterners had seen before. (Caswell edit: we didn’t realize we had done anything wrong and the officer sounded like he was ordering a double double animal style through the speaker at In-n-Out. All we could really make out was double double something or other.) Of course, this was only after being turned away from the bar due to capacity. So, no margaritas. We worked out of Strategic Racings Designs (SRD) which is owned by a great couple, Justin and Heather Herrmann, and we couldn’t have found a better shop for our needs if we tried. But even then, it was hard work. From this point our days went something like in bed around 3:00 am and up at 6:00 am. This was vacation after all and I thought many times about quitting. But, Caswell has this way of making everything sound so awesome I never could throw in the towel. 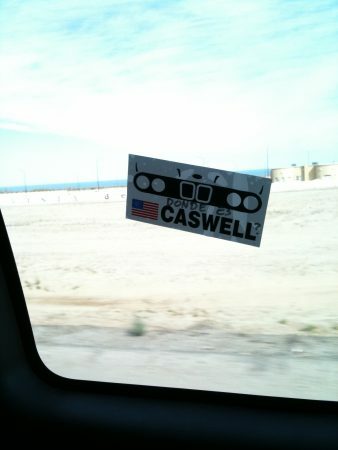 Caswell does things the way a most people don’t. Which is both brilliant and comes with some need to improvise. As only a finance guy with an MBA would, he determined long ago that it was financially better to rent a tow vehicle than buy one when you factor in wear and tear, insurance etc. 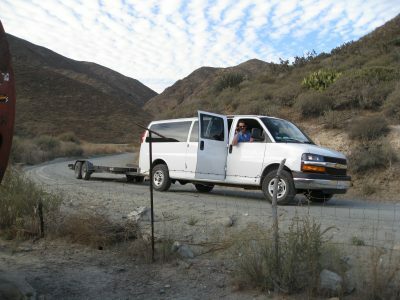 The problem was: no one really rents a normal tow vehicle. Fortunately it’s cheap and easy to install trailer hitches. Thankfully. 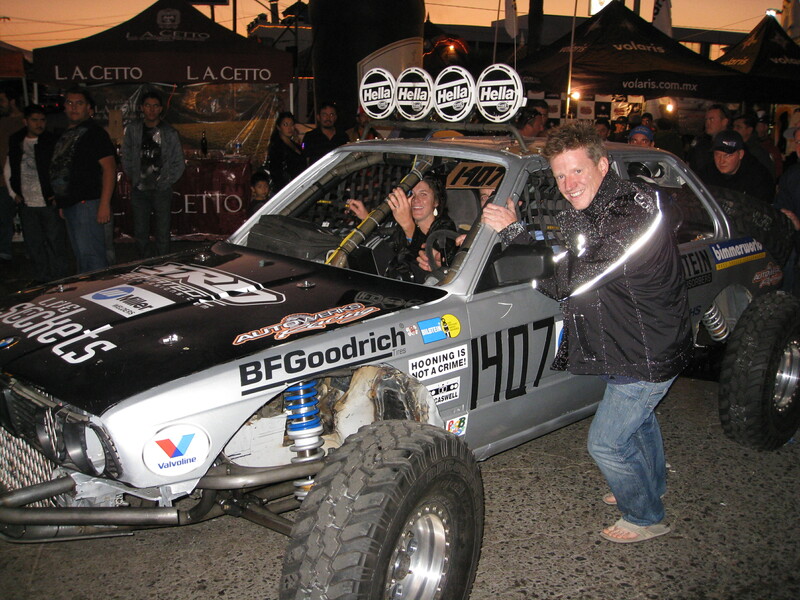 When we loaded the Baja Pig on the borrowed trailer a few days before Contingency it was nothing short of amazing. On one hand, the car had come such a long way in such a short time. 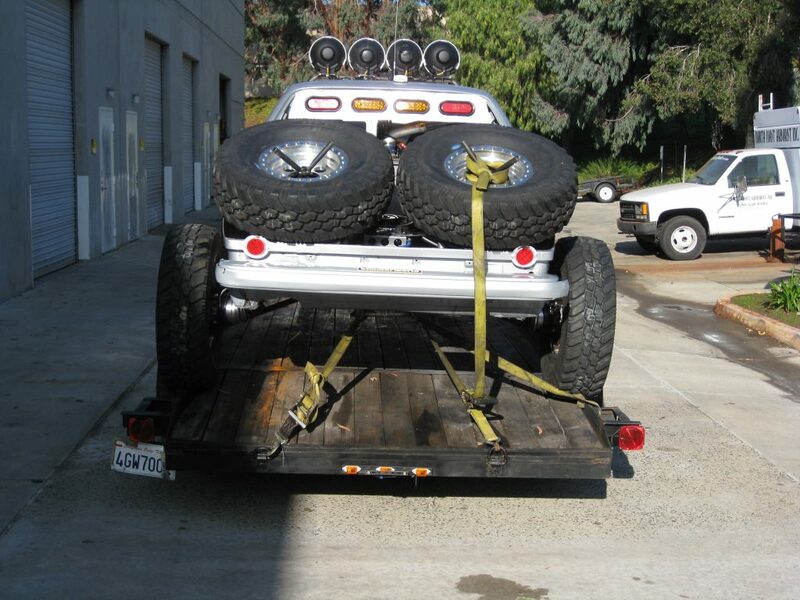 On the other hand, a car built with no DOT guidelines in mind meant it was wider than the trailer. Like, a lot wider. Using some ingenuity, the trailer’s hand crank winch and a power drill (to turn the winch of course) we loaded the car on the trailer where it was sitting on the tiniest bit of the tire’s inside lugs. Hell, strapping it down was scary. The smallest movement meant it was frame on trailer. As we crossed the border, I just wanted to sleep. But, I couldn’t. 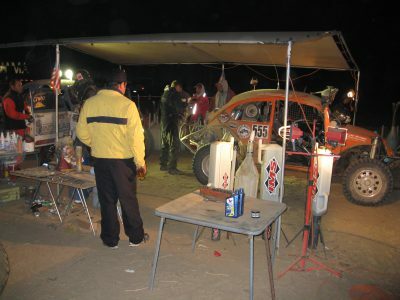 The typical commotion from a group of friends crossing an international border plus the Baja Pig bobbing up and down on the trailer behind us kept me awake. Coming into Ensenada the first thing you see is a HUGE Mexican flag. It was incredible. We had made it! 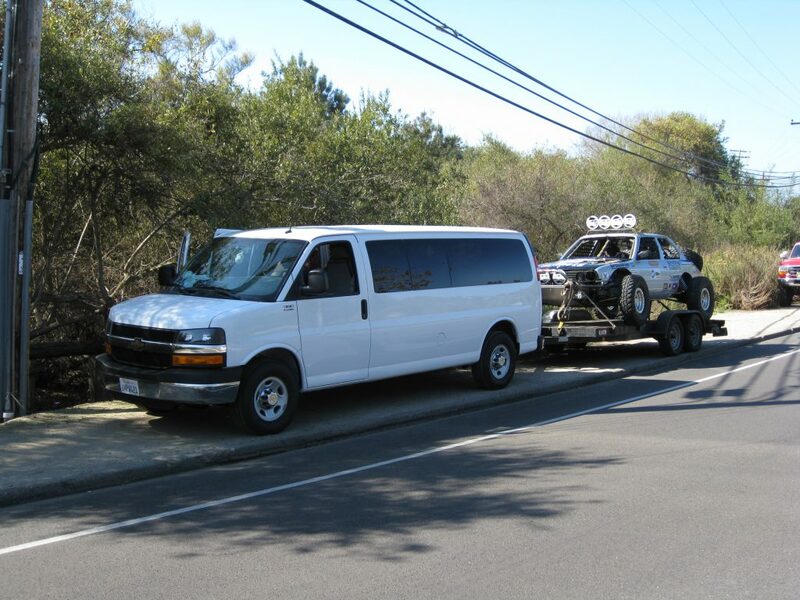 We found a place to dump the van and trailer, found registration and headed to Contingency. 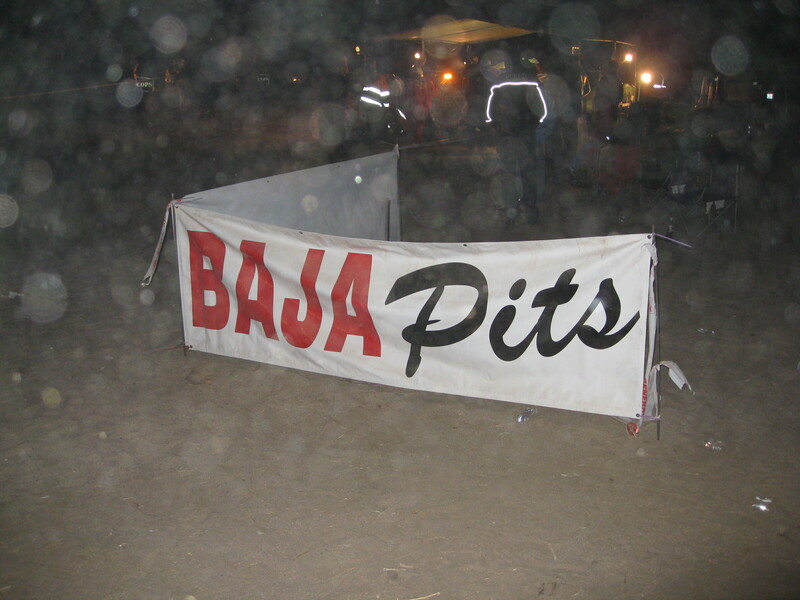 The Baja 1000 Contingency: if you have never had the experience add it to your bucket list. It’s impossible to put into words. Vendors everywhere, live music, DJs, race fans for blocks, and dancing Tecate girls… although I think these are just dancing CocaCola girls. Everyone has dancing girls at Contingency. I was driving when I brought the car into the line for Contingency. 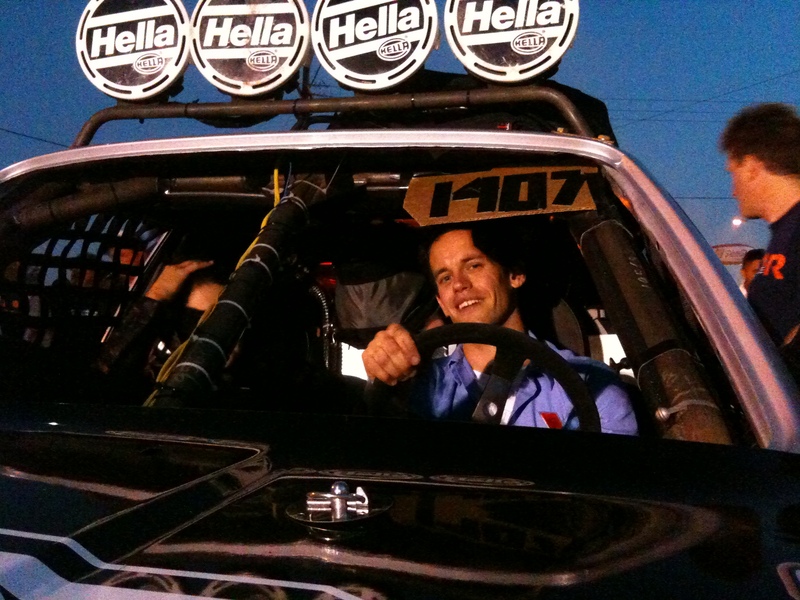 We hadn’t been able to test anything on the car really to this point. And, a low fuel level wasn’t on my mind. Until it stalled. We ran out of gas in line for contingency and tech inspection. Thankfully, the crowd is great and we’re more than willing to help get the car to the end of the row. Passing tech was stressful. We pulled in behind a pro team. 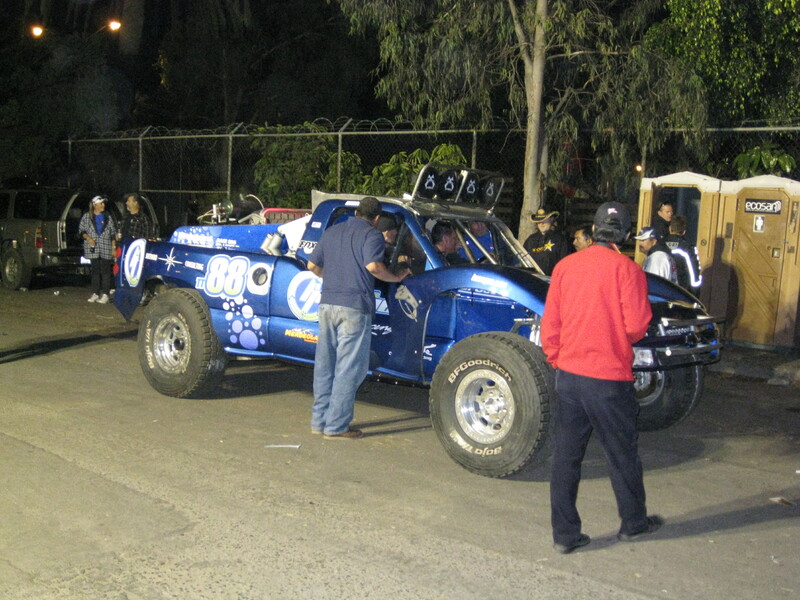 Their truck had finished the Dakar rally earlier in the year. What the hell were we doing? I had been racing sports cars for about a decade at that point. I had never seen an inspection that thorough. It makes sense though. It can be life or death in the desert. I gained a healthy respect for good inspections. The next day we woke up early to do some last minute checks. Luckily, we found our first problem when we could all still work on it. The first steering rack started leaking over night. We swapped in the spare just in time for the start. And, that is when the fun started. Once the cars were gone, our chase crew – the best guys I could think of living with in a van while towing a trailer, Chris Simon and Sam Smith – headed south out of town. Our plan was to leap frog the race car. I was set to drive after the first stint. Then we would swap again after about 300 miles. 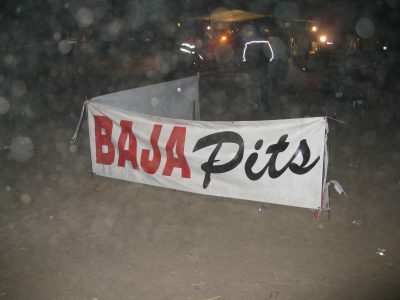 Our goal was to get to the Baja Pits near Coco’s Corner. Chris took the first driving shift. 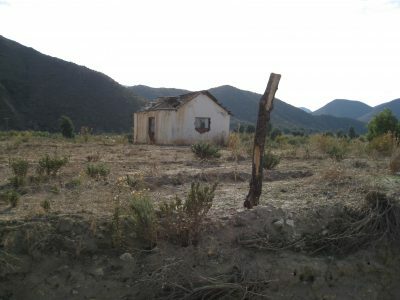 Shortly after leaving town we learned a few things. One: we had no communication with the race car. 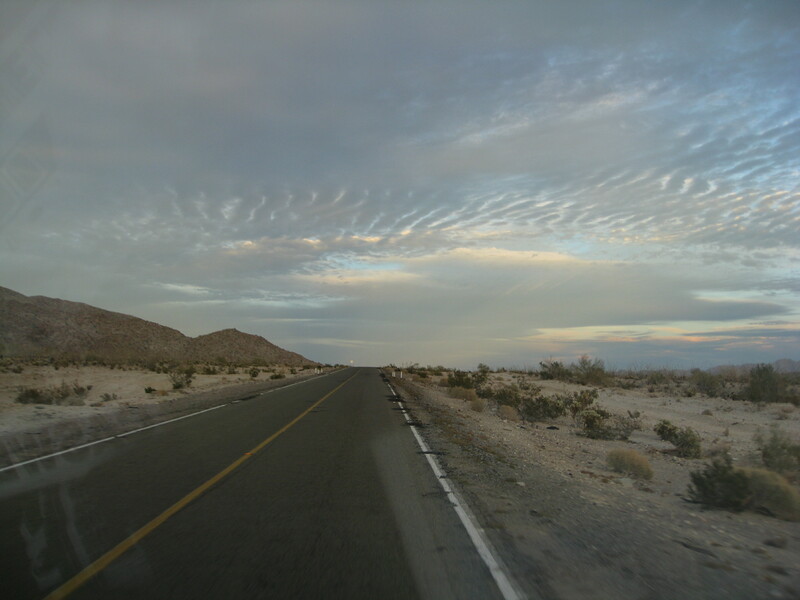 Two: roads in the Baja are not always paved and maybe be dirt or mud. Three: there must be a lot of truckers who have died as there are truck-looking memorials all along the road. Knowing I would need to be fresh when driving, as I dozed off noticed the cacti are huge along the road. 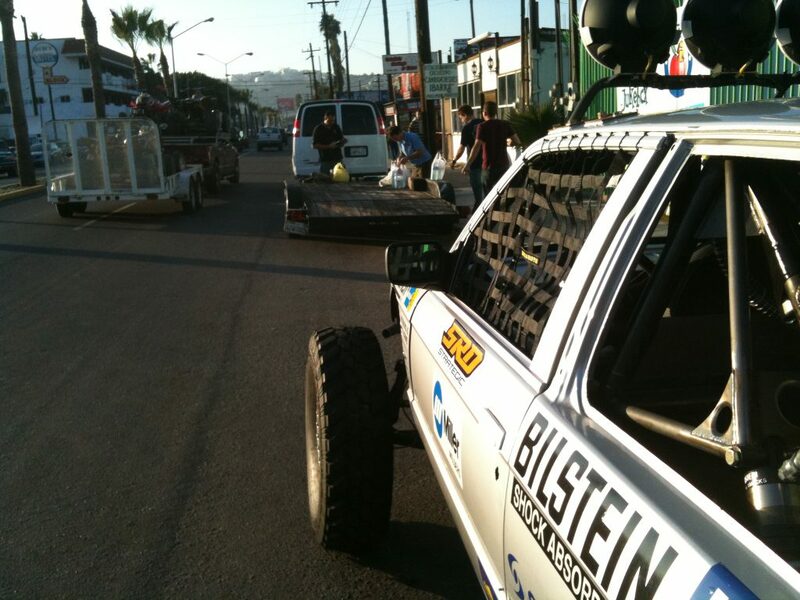 Back on the road, making good time, we started to try and reach Caswell in the race car. 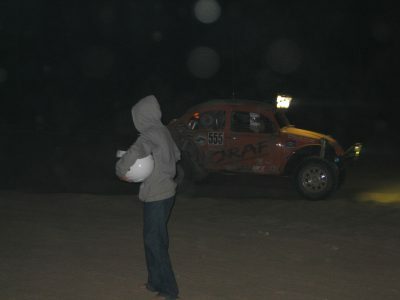 No luck, but that is when we discovered the relay of radios. 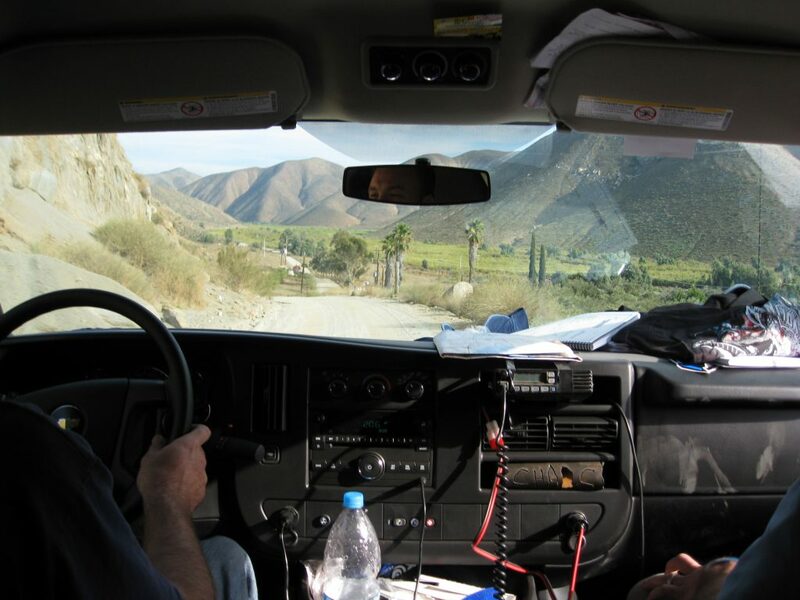 Dudes set up HAM radios in the mountains and act as radio relays between dead zones. We found out that the car was still moving and so far was so good. 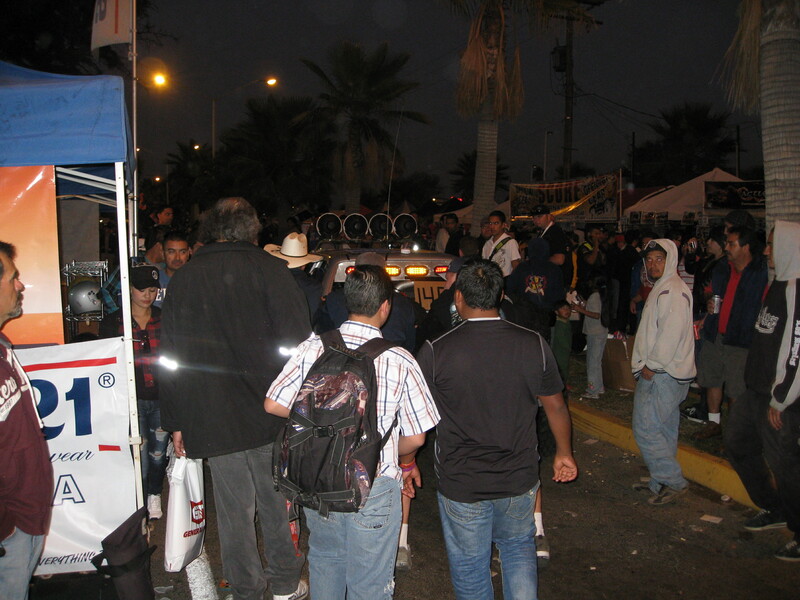 I had lost count at this point how many police checkpoints we had to go through. Three? Maybe five? I had been told by a friend who had done the race before that it was important to carry swag. Hats and stickers and stuff. This came in handy at the checkpoints. At first we were a bit apprehensive about handing stickers to armed guys in camouflage, but we quickly found out the loved it. 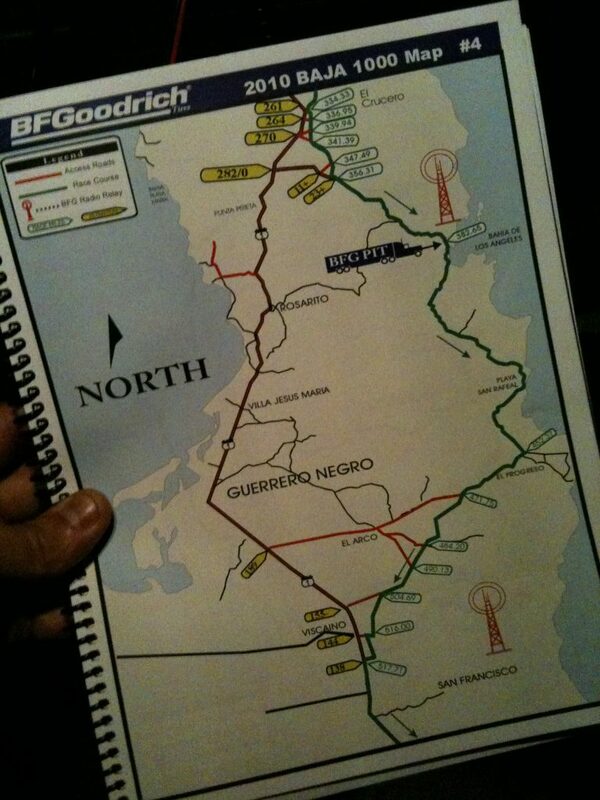 At one point we thought we were screwed when the checkpoint leader was requested to come out. We ended up taking a group picture with the entire checkpoint and came away with an awesome Mexican flag to hang in the van. ¡Viva la Mexico! 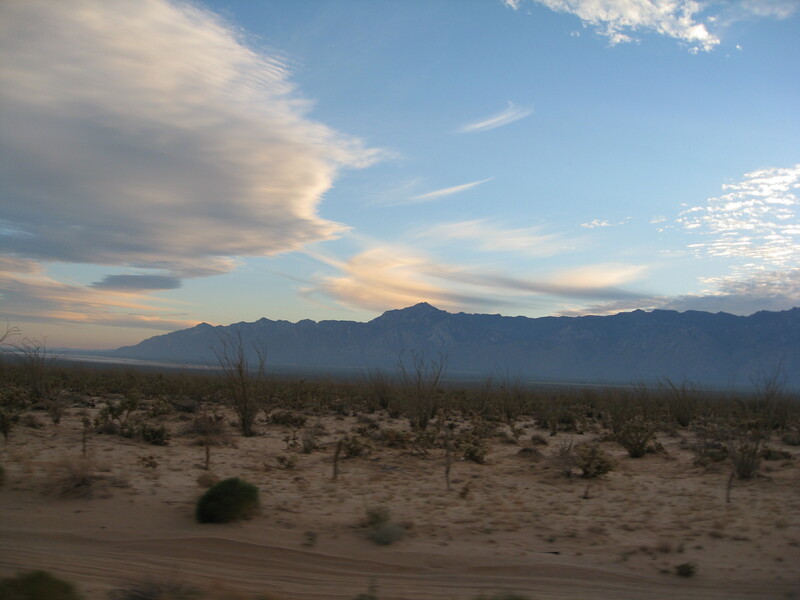 The desert is beautiful. When you are chasing it’s a mixture of ensuring your team keeps moving, but also you get to see parts of the world you would otherwise never see. When the sun set over the mountains, though, it got dark. Really dark. When we got close to our first rendezvous point with the race car everything became eery. 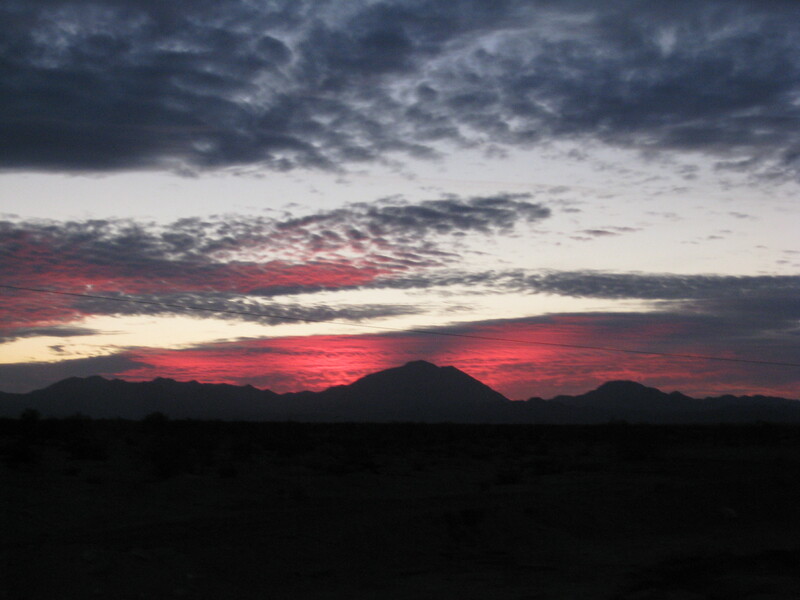 In the distance there was dust and fire. The scene could have been directly out of a Mad Max movie. As we got closer we could make it all out. There was a decent crowd of chase teams, fans and medical crew set up around the pit. We parked and walked among the group. Everyone was friendly. 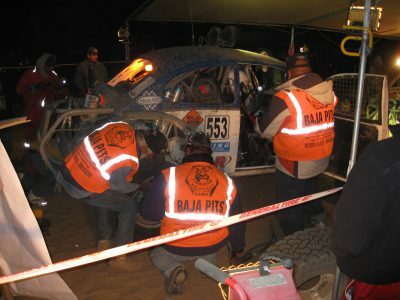 There were teams fixing broken stuff. 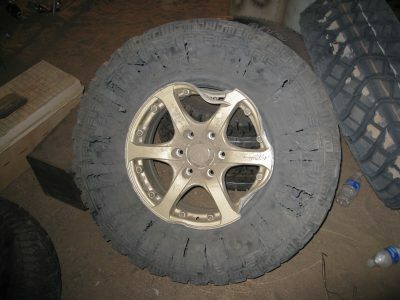 Broken parts, wheels and tires were lying all around on the ground. Some teams using the then new Ford F150 Raptor were heading north on the course to pull their stuck cars further south. 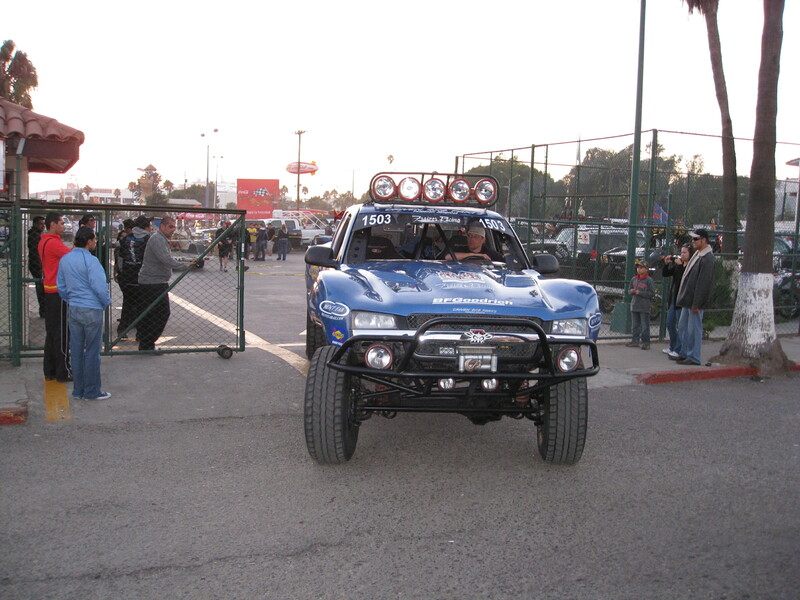 According to them, the stock Raptor likely would have been a better entry than their race vehicle. We talked to a few folks with better radio systems. As far as they could tell the Pig was still moving. The fire-lit night would be interrupted every 10-minutes or so by piercing LED lights in the distance followed by the sound of wide open throttle cracking through the desert. Without good communication with Caswell, I waited. 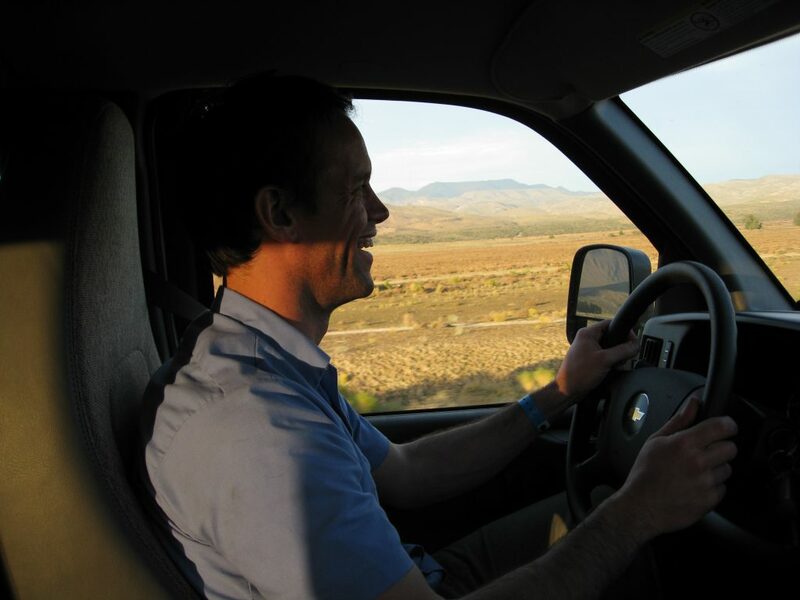 Half asleep, half awake sitting in my driver’s suit in the front seat of the van. Smith, Simon and I talked. They fell asleep. I kept looking. Waiting for my ride. Unfortunately, it never came. Finally, I moved to the bench seat and passed out. After a couple of hours we heard from race control that our car had stopped progress. According to GPS tracking it was stopped now, off course. 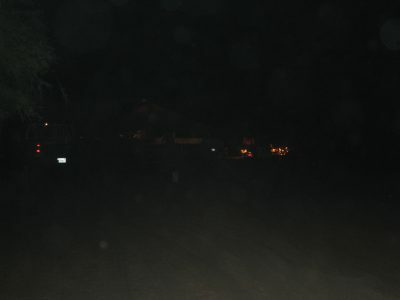 Without the ability to contact them we feared the worst, but assumed the best and headed back north. Ten or so minutes on the path we started to wonder if we weren’t sent that way to be hijacked. 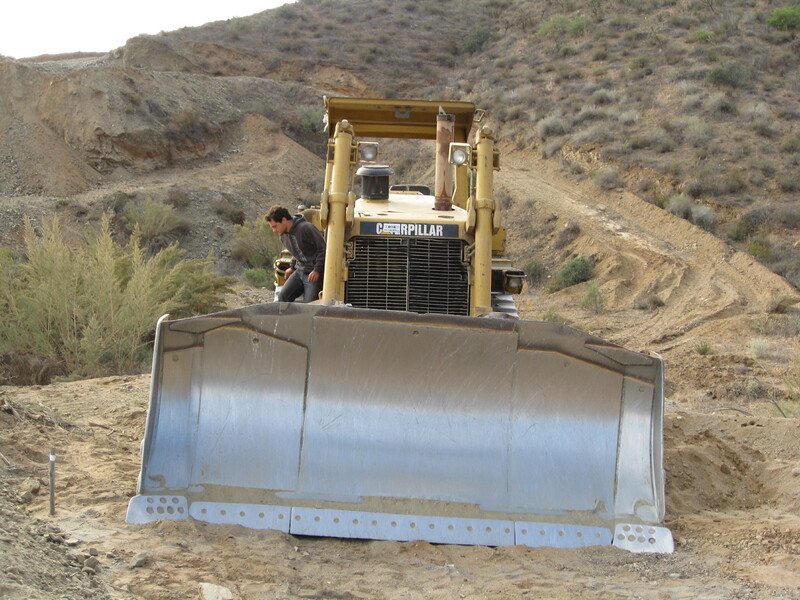 The road was at best washboard and rutted dirt. If it were to start raining we would be screwed. We stopped and took pictures with cows, climbed around on seemingly abandoned bulldozers and made a point to enjoy the trek. The “road” wound up through the mountains. On occasion it had sheer drops into the valley on one side or the other. Simon was driving. We were getting side ways. Van and trailer were getting airborne on a series of whoops. And, we were laughing. A lot. 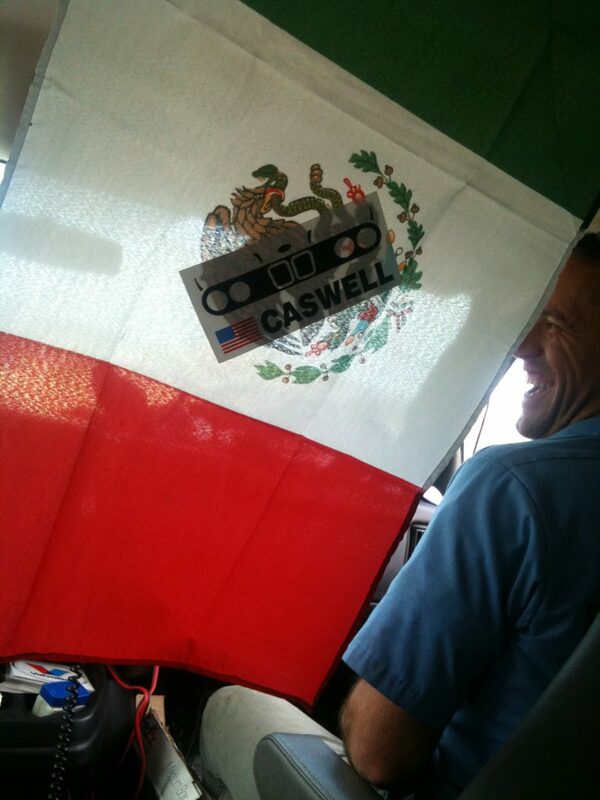 When we got to San Felipe and found Caswell, we shared stories over margaritas and beers. I am pretty sure the chase team had more fun that year than the guys in the race car. If you want to read more of DIY BAJA check out the first article in the series. ← Previous Post: For Sale: Off Road Mini Cooper!